“Should old acquaintance be forgot and old lands endddddd!” or however that song goes. Yes, that’s right it’s 2019. The year of flying cars, neon Atari adverts, awesome red motorbikes whipping around the streets of neo Tokyo and Rutger Hauer talking to birds. 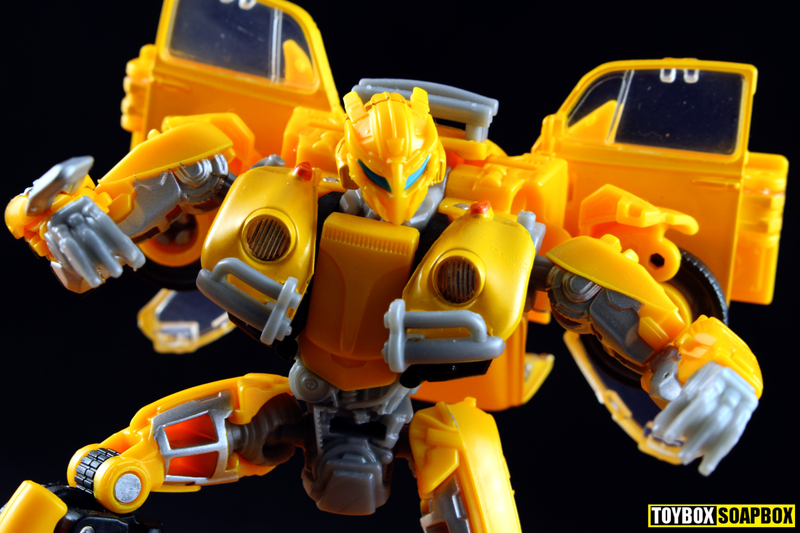 So what better way to star 2019, than by goin’ back in time to 2018 and running down a list of 10 transforming robot figures that floated my boat last year. “You never know where you’re going – till you know where you’ve been”. In a demonstration of how lazy I have been this year, very few of the toys on list actually made their way onto the site with their own articles. 2019’s New Years Resolution then is write more stuff. Same as 2018’s…and 2017’s…I am sensing a pattern here. As always, this is just a fun list of toys that I personally enjoyed from 2018 and if you don’t agree you do not have to send me abuse. Channel your anger onto someone who is more deserving of it – like that Colonel who framed The A-Team. If your reason for existing is the improvement of others, then you deserve to be on this list. 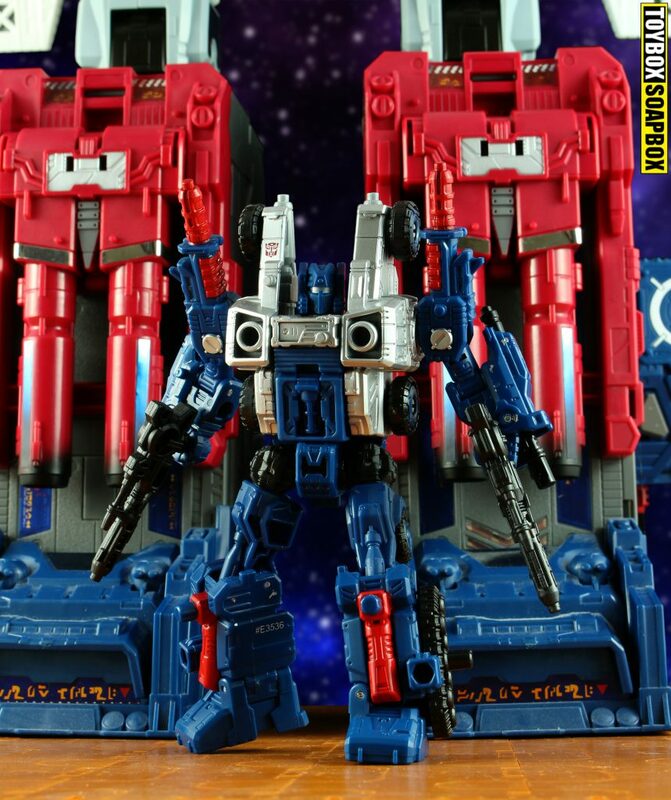 The first “gap filler” in the Siege line, after being absent when Fortress Maximus popped up during Titans Return, COG can be brutally ripped apart and his body parts used to adorn any other bot as either planet singeing weaponry – or a pair of New Rock boots. Even without that talent, COG is a great looking figure in his own right, irrespective of if his alt modes fall more into “things that just exist” category. I ummmed and ahhd over the inclusion of this toy because I HATE the transformation. Like the full on kind of hatred that is usually reserved for the likes of that airport level on the NES Teenage Mutant Ninja Turtles video game. Still riding a delightful wave of nostalgia from the movie though, and drinking snowballs that didn’t get drunk over Christmas, looking at this figure gives me a warm fuzzy feeling or joy in my heart. Or perhaps that’s heartburn. Regardless, the reduction of all the hyper detailing from the previous Bayverse design gives Bee a chance for some personality to poke through and this figure does a bang up job of translating most of it into plastic. 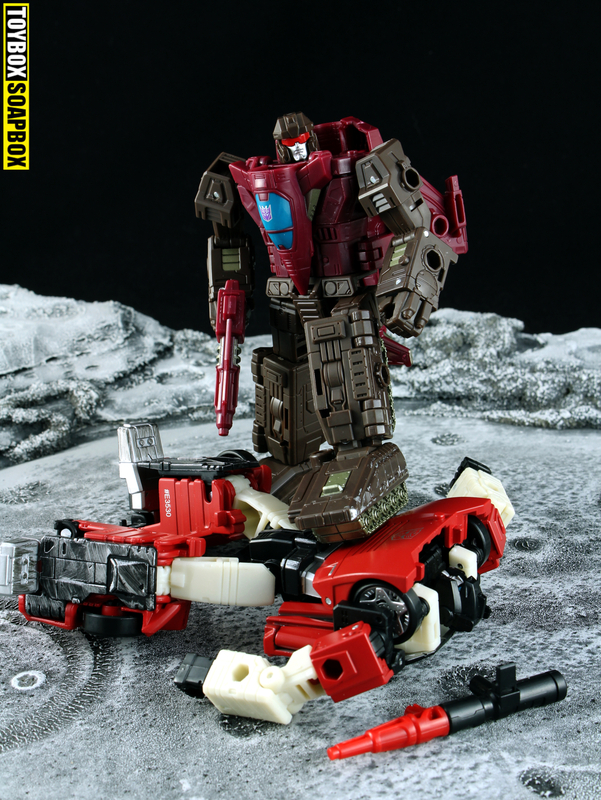 Flywheels executes the Duocon gimmick in a much more nostalgia tickling way than PotP Battletrap managed, and as such knocks him off of this list more viciously than Shawn Michaels throwing Marty Janetty through a barbershop window. All three modes are solid and Hasbro sprinkle enough IDW spice over a very authentic G1 design to appeal to all corners. Always a fan of the weirder late 80’s portion of G1, seeing characters like Flywheels get new toys that hew so close to the originals, instead of just being half arsed repaints of other unrelated characters, is turning this into a golden time of collecting for me, because I get that version of the character I wished I had when I owned the original. Actual moving legs alone seem like a miracle. 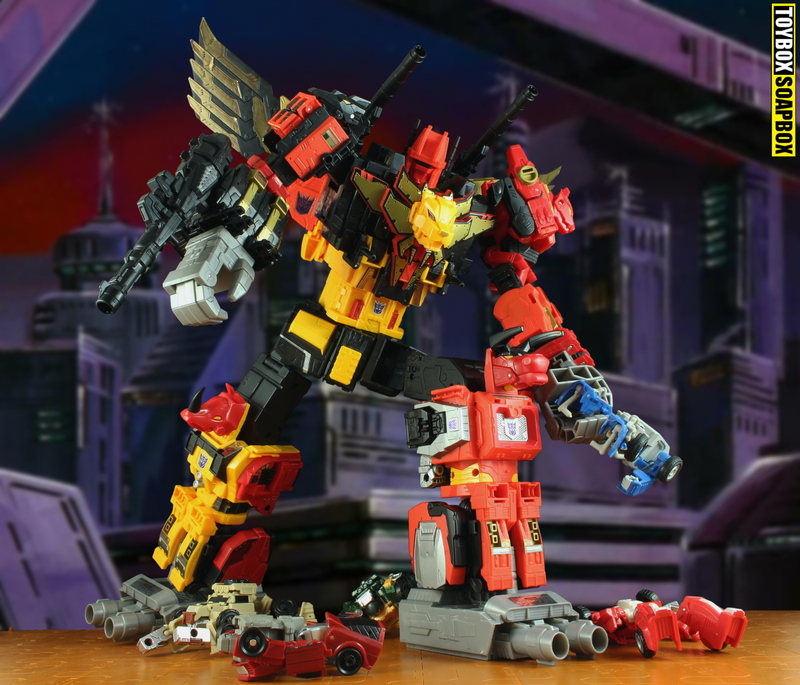 2018’s Titan Class entry was one of the combiners that was notably absent from Combiner Wars – Predaking. 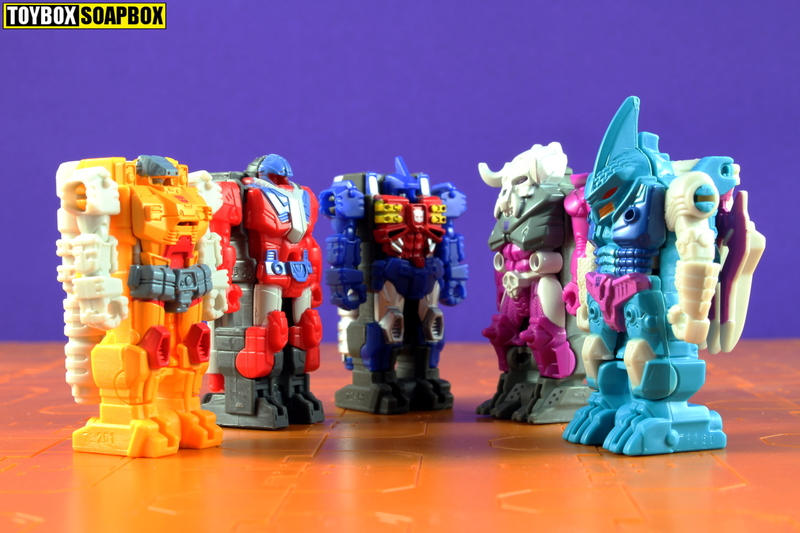 Featuring all 5 original Predacons in forms so blocky they could get mistaken for Tetris blocks, this set proved quite divisive with Hasbro doubling down on the simplicity element of quick combination from Combiner Wars, at the expense of the aesthetics and articulation of the individual team members. Your mileage with that will vary, but for me personally it worked because the joy of combining Transformers has always been in combining them. The fun to be had here is from playing with them but Predaking himself still stands tall as a fantastic piece on display. Even if it is a constant reminder of those wretched Hasbro foil stickers. Ugh. 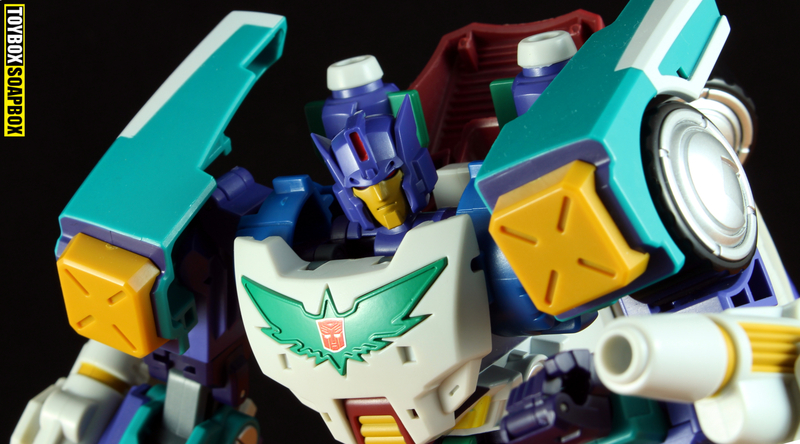 Thunderclash is the greatest Autobot in the universe – how could he not be on this list? You know Hell has frozen over folks, when a Bayformer makes this list. 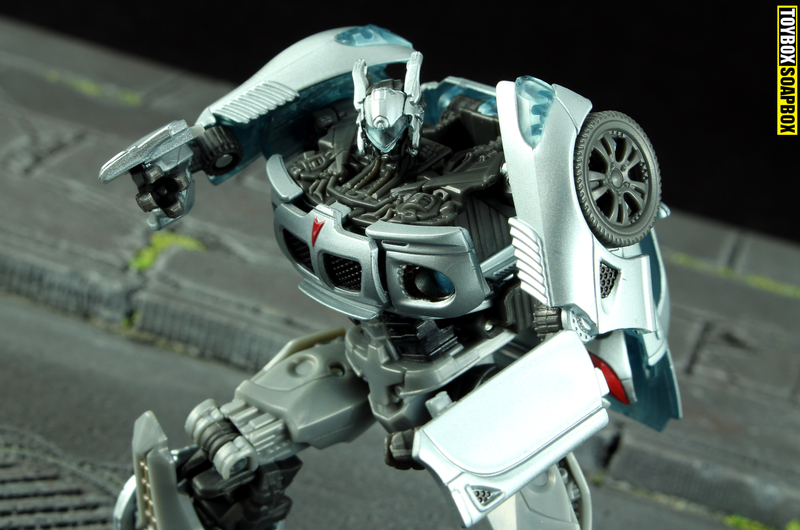 Jazz is one of the very few movie Transformers who was bestowed with a clear, clean robot form and didn’t just look like a drawer of cutlery being hurled at the screen. You can tell who he is at all times because he has a clearly defined shape. As such he’s always been the one design from the live action movies that I really liked, as he seems like he was designed for a completely different film to the rest of them (See: squashed bug Dorito Starscream). Hasbro’s Studio Series has been pumping out what I assume are the best representations of Bay’s house of horrors, so I was hoping we’d see a decent interpretation of Jazz and 2018 was good enough to oblige. Yes I may actually have bought it in 2019, but it came out in 2018 so congratulations Jazz….YOU JUST MADE THE LIST. Also it’s my list so I literally make the rules. Hasbro reintroduced The Pretender concept after 30 years of undeserved derision in the most perfect of ways, by shrinking them down and turning them into accessories for the larger figures. Like chihuahua’s and Paris Hilton I guess. The fun thing is that they are now reborn as “Decoy Suits” which means that even the Pretender name is hidden behind a Pretender. At this small size they not only make more sense as disguises, with some brilliantly funky designs that were a hallmark of this era, but their functionality adds an extra dimension and play factor with other figures. They aren’t just their own strange thing, sat on the sidelines as the best players had already been picked, they are an integrated part of the line. There is barely any articulation but they don’t need it as it’s not where their appeal lies. Also, if you don’t like Pretenders- then you are just wrong. The band are alright too. 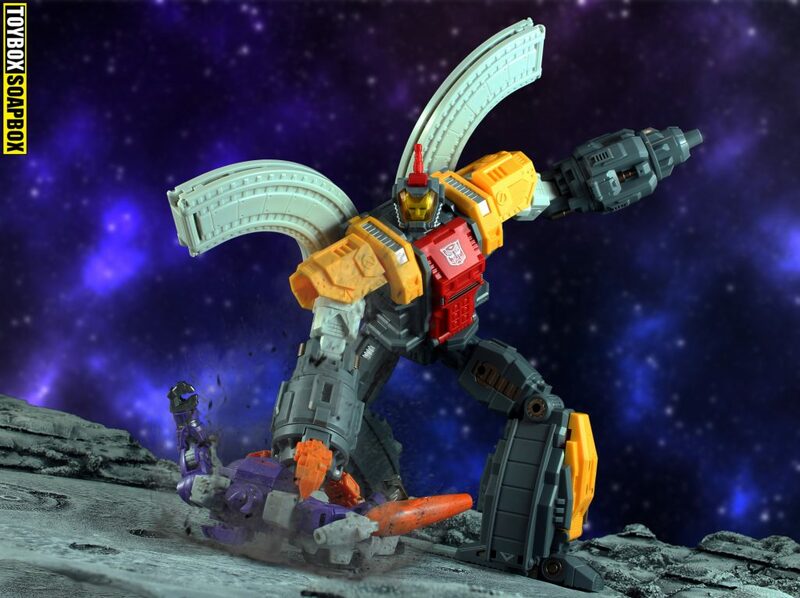 Omega Supreme must be part of the Chinese Zodiac as it’s the only reason I can come up with for why so many third parties spent 2018 knocking out toddler sized versions of the character. Mechfans Toys (I can never figure out where the space in that goes) decided to sail from the choppy waters of Knock Off Bay to the calmer tides of Port Originality with their first (I think) original figure. Scaled towards to the smaller end of things, it’s still a solid leader class sized chunk of toy but it’s much easier on the wallet and display unit. Instead of being slavish to G1 it adds a nice modern sparkle to an otherwise classic design and transformation, but the most important thing it retains, that the larger Omega offerings don’t shoot for, is that core essence of being a fun toy to play with. At such a smaller size it’s way easier to pick up and fiddle with, where the others may have all of the features and accuracy you’d expect but their size makes them impractical. Who doesn’t look a tank train on a rocket base? 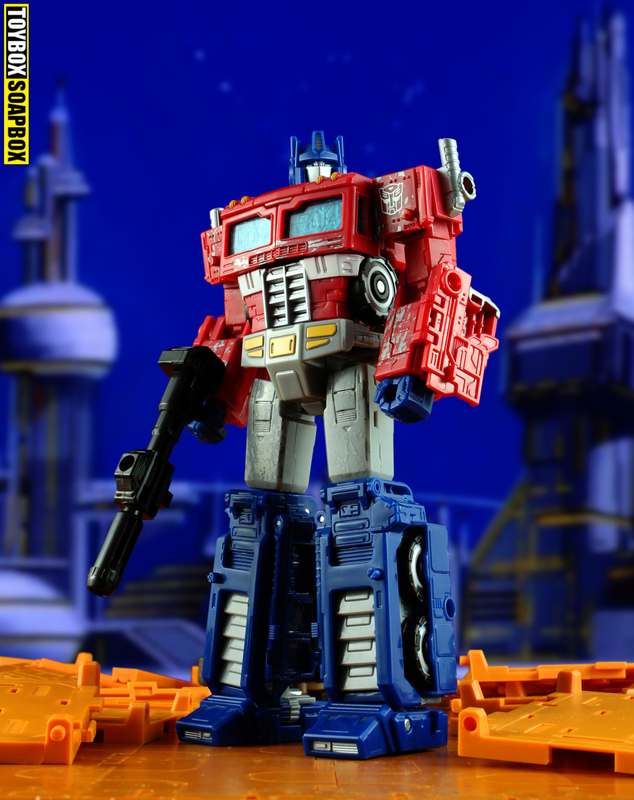 For the last 30 something years I have craved a Powermaster Optimus Prime figure who captures the badass G1 box art. Tearing it open on Christmas morning 1980something, I will never forget my first sight of that art as the paper ripped, my imagination instantly spiralling before I’d even got the toy out of the box. Maketoys Thunder Manus isn’t a direct reproduction of that box art but it’s the closest anyone has come to capturing it’s essence this far. Thunder Manus screams the chunk and ferocity that the original box art implied, in an updated form with all of the higher end modern trappings you could ask for. Tons of detail covers this figure without threatening to overwhelm, with so much of it being a fusion of exaggerated recreations of detail found on the original toys and animation models, but also a mech vibe that Fansproject are more famed for. It all comes together in a wonderful package that gives you a lot of plastic for your money. For the longest time I was convinced this would be my number 1 toy of the year and there was absolutely no way anything could knock it off, but then I’ve always been terrible at predicting the football scores so it tracks that I’d be just as bad at predicting this list too…. By far, this is the most surprising entry on the list for me, never mind it taking top spot. We see so many Optimus Prime figures in every new line released that it becomes easy to almost regard them as white noise, but this is about as close to a perfected toy form of the character and it absolutely stole the year. I never expected to like this toy as much as I do but there is so much to unravel with it. From the slightly more complex transformation which steps back from the previous ethos of simplicity, the return of more intricate panels and tabs, to the higher levels of articulation, large amount of paint apps and general attention to detaill – this toy feels like Hasbro’s first attempt at creating a Transformers version of Marvel Legends. 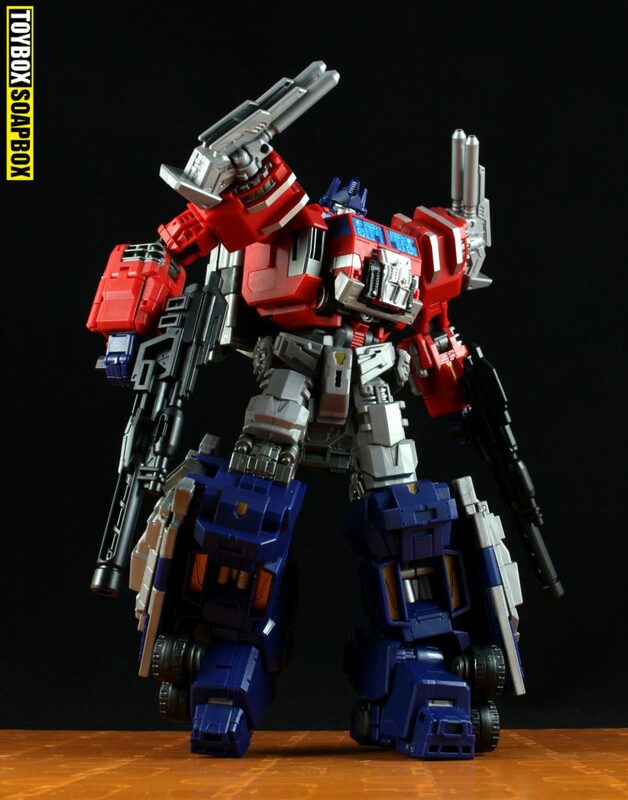 Optimus is normally saddled with having to be the poster boy who sells whatever the latest lines gimmick is, but as Siege’s gimmick is so unintrusive it gives the designers much more room to get as close to the perfect representation of Optimus Prime as possible. For future reference, any toy that has a Back to the Future 2 style hover mode is probably always going to top this list.